This is the best compact car for you if you prioritize function over form — and fun. Other small cars are better looking and more exciting to drive, but few approach this Toyota’s brew of fuel efficiency, reliability, standard safety features, and value pricing. That’s why Corolla has been a worldwide sales success for more than five decades. The compact-class sedan returns for model-year 2018 with only minor changes: sunvisors gain illuminated vanity mirrors and top-level models get a new steering wheel. The current generation of this four-door sedan was last redesigned for model-year 2014. A model-year-2017 freshening revised the styling and introduces a suite of standard driver-assistance features, which earned it top safety ratings. Model-year ’17 also saw the Corolla lineup add a subcompact-class four-door hatchback, called the iM, inherited from Scion when Toyota shut down its youth-oriented division. Sales of the iM have increased nearly 20 percent through the first three quarters of 2017, while the Corolla sedan is down roughly 10 percent. Still, Toyota dealers sell 15 sedans for every iM hatchback. Among compact cars, Corolla sales trail only the Honda Civic, which offers sedan, hatchback, coupe, and high-performance variants. They’re well ahead of the third-place Nissan Sentra, which comes only as a sedan. Toyota officials would like to at least keep the Corolla treading water until the next-generation model arrives in. Little reason to wait for the 2019. It’ll almost certainly be a repeat of the ’18, but cost more. And it’ll be a lame-duck design, with an all-new, next-generation Corolla set for introduction during calendar 2019, as a 2020 model. The redesigned Corolla will get new styling and should be more rewarding to drive. For model-year ’18, the Corolla sedan lineup returns six models: the rental-grade L, the volume-selling LE, the mileage-maximizing LE Eco, the sportier SE and XSE, and the top-of-the-line XLE. The iM hatchback continues as a single model with no factory options, a policy held over from its days as a Scion-branded product. All versions, including the iM and sport-themed SE and XSE, favor passenger comfort and fuel economy over all-out performance. All Corolla models come standard with safety features for which most rivals charge extra, and then limit to only their most expensive trim levels. Bundled under the Toyota Safety Sense label, these include lane-departure warning, high-beam headlights that dim automatically to spare oncoming drivers, and vitally, autonomous emergency braking that can automatically stop the car to mitigate a frontal collision with another vehicle. Corolla sedans include another layer of safety features, adding pedestrian detection to the autonomous-emergency-braking system, automatic steering correction to keep you in your lane, and radar cruise control that can maintain a set distance from traffic ahead. All that earns Corolla sedans the coveted Top Safety Pick+ rating from the Insurance Institute for Highway Safety. Styling: No changes for 2018. The sedan’s styling was refreshed for model-year ’17, adopting a more angular look with echoes of Toyota’s RAV4 compact crossover SUV, Prius hybrids, and redesigned 2018 Camry sedan. The hatchback retains the styling it’s had since its launch as the 2016 Scion iM. No Corolla is a design standout, but that’s not necessarily a bad thing. While the sedan lacks the graceful form of the Mazda 3, it avoids the extraneous lines of the Civic. A highlight is that LED headlights are standard on all sedans; they’re brighter and more energy-efficient than standard halogen bulbs and even optional xenon headlights on most rivals. Inside, the sedan boasts above-average passenger room. The seats are very comfortable. This is not a car that’s designed to be driven aggressively, so the front seats’ lack of lateral support is not a dealbreaker. The instruments are large and easy to read. 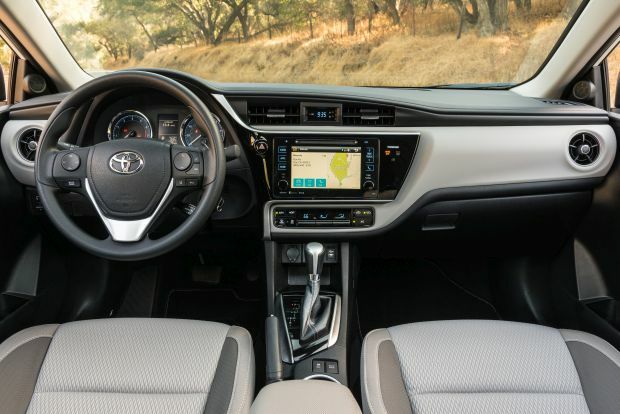 All sedans except the base L grade also offer versions of Toyota’s proprietary Entune infotainment system with varying degrees of functionality, depending upon which trim level you select. A connected smartphone can supplement built-in applications, including various streaming audio services. Imbedded GPS mapping is available as a factory option on higher-end models and as a dealer-installed upgrade on the iM. Hatchbacks are not available with Entune, and no Corolla of any kind supports Apple CarPlay or Google Android Auto. The iM is jazzier looking than the sedan, and has the advantage of a more versatile hatchback body style, with 20.8 cubic feet of cargo volume behind its rear seat, versus the sedan’s 13-cubic-foot trunk. It’s notably smaller than the sedan overall, though, with a wheelbase (the distance between front and rear axles) briefer by 3.9 inches and a body 13.1 inches shorter. We place it in the subcompact class, where its passenger and cargo room closely align with those of cars like the Nissan Versa Note. If the iM has enough space for your needs, it’s well worth considering given its value pricing and high level of standard equipment. Mechanical: All Corolla models are front-wheel drive and have a 1.8-liter four-cylinder engine. All sedans except the LE Eco have 132 horsepower and 128 pound-feet of torque. The Eco actually has slightly more horsepower (140) but less torque (126). Hatchbacks have 137 horsepower and 126 pound-feet of torque. The iM and SE sedan come standard with a 6-speed manual transmission. A continuously variable automatic transmission (CVT) is standard otherwise and is a $740 option on the iM. Note that the SE sedan with the manual actually has a starting price $1,220 more than the CVT-equipped model, but it comes standard with a power sunroof, keyless entry with pushbutton ignition, and an upgraded infotainment system. These features are optional on the SE CVT. Acceleration is middling at best with the manual transmission and borderline sluggish with the CVT. It doesn’t help that the CVT allows the engine’s speed to race ahead of the car’s road speed, making you feel like you’re not making as much forward progress as you really are. The manual shifts smoothly and has a light clutch, making it easy to drive even in heavy traffic while simultaneously allowing you to extract the most from the engine. Trying to drive enthusiastically in a Corolla sedan is a fool’s errand. Numb steering, lots of body lean, and only modest tire grip (even with the wider 17-inch tires on the SE and XSE) conspire to rob this car of any potential fun. The tradeoff is good ride quality, though the car is prone to hobby-horse pitching motions when traversing wavy pavement. It’s not all doom and gloom, however, as the iM hatchback handles much more competently due to its tighter steering, fully independent suspension (sedans use a cost-saving solid rear axle), and grippy 17-inch wheels (all Corolla models except the SE and XSE use either 15- or 16-inch wheels). You won’t mistake it for a Mazda 3 hatch or VW Golf, but for its price, the iM may very well win you over. Features: All 2018 Corolla sedans get illuminated sunvisor mirrors for the driver and front passenger. All models continue with a tilt/telescopic steering wheel with controls for audio and Bluetooth hands-free phone voice command. XLE, SE, and XSE trims continue with a leather-wrapped steering wheel that includes paddle shifters on CVT models that enable the driver to replicate manual-type gear control. For 2018, the steering wheels of XLE and manual-transmission SE models add controls for the radar cruise control and lane-departure systems. Other than that, the sedan and hatchback are complete carryovers. Kudos to Toyota for including driver-assistance features as standard equipment on all grades. The only thing missing is blind-spot alert with rear cross-traffic detection. We wish the iM would have the sedan’s pedestrian detection, automatic steering correction, and radar cruise control. As far as convenience features, all sedan and hatchback models include Bluetooth connectivity, power windows and locks, and complimentary scheduled maintenance for the first two years or 25,000 miles, whichever comes first. LE and above sedans add Entune with a 6.1-inch touchscreen display, remote entry, and automatic climate control. XLE and SE manual models have a power sunroof and upgraded Entune system with GPS mapping support through a connected smartphone. XLE, XSE, and all SE versions have seats trimmed in Toyota’s “SofTex” imitation leather and a power driver’s seat. XLE and XSE add heated front seats. The iM fits somewhere between the LE and SE sedans in terms of standard equipment. They include a 4.2-inch touchscreen audio system, Bluetooth, rearview camera, dual-zone manual climate control, and a sport suspension. 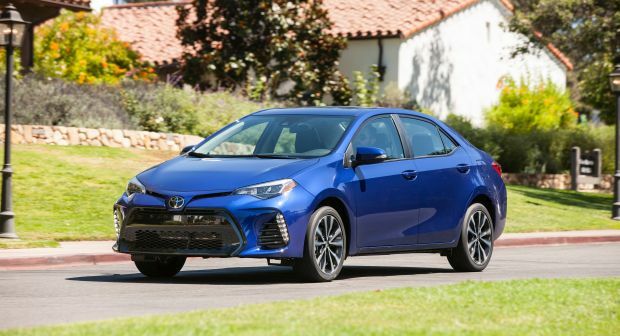 Year-over-year price inflation has not affected the 2018 Corolla line too much. Starting prices are up by about $50 on average versus 2017. Note that base pricing listed here includes Toyota’s $895 destination fee. For the sedan lineup, the L starts at $19,445. The LE, which starts at $19,880, is a much better value for its standard automatic climate control, rearview camera, and Entune infotainment system. LE Eco versions begin at $20,280 and include slight modifications designed to maximize fuel economy. Base prices for the 2018 Corolla SE is $21,390 with the CVT and $22,610 with manual transmission. The XLE starts at $22,880 and the XSE at $23,625. Most factory options for the Corolla sedan come in the form of packages. The LE’s $1,665 Premium Package with Moonroof includes a power sunroof and upgraded Entune system with 7-inch touchscreen, smartphone GPS mapping, satellite radio, and 16-inch alloy wheels (up from standard 15s). This package is also offered on the LE Eco ($1,965) and SE CVT ($1,535); the former adds extra chrome exterior trim while the latter doesn’t include any alloy wheels as those are standard. Imbedded GPS mapping is a $525 factory option on the XLE and XSE and a $900 dealer-installed add-on for the iM. The 2018 iM is priced from $19,745 with manual transmission and from $20,485 with CVT. 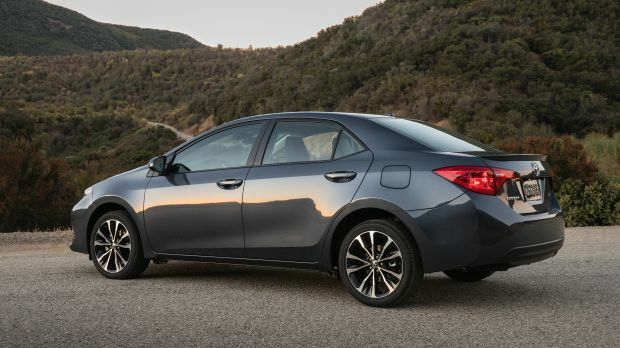 Our top pick of the Corolla lineup would be a manual-transmission iM. With a sticker price of less than $20,000, it’s practical and by far the most enjoyable to drive of the lot. Among sedans, we would probably go with the SE. As more than 90 percent of buyers will pick the CVT, make sure to add the Premium Package so you can get the upgraded infotainment system and sunroof. That will carry a sticker price of less than $23,000. Either choice can potentially cost thousands less than a comparable Cruze, Civic, 3, or Golf, but remember that you’re trading power, handling, and overall refinement in the process. Corolla’s EPA ratings are average to slightly above in its competitive set and vary based on transmission and wheel/tire selection. L and LE models with the standard 15-inch wheels rate 28/36/32 mpg city/highway/combined. The LE Eco with 15-inch wheels rates 30/40/34 mpg. LE and LE Eco models are available with 16-inch wheels, and so equipped, their respective are 28/35/31 mpg and 29/38/33 mpg. SE manual models rate 27/35/30 mpg while the SE CVT, XLE, and XSE rate 28/35/31 mpg. Corolla iM models rate 27/35/30 mpg with the manual transmission and 28/36/31 mpg with the CVT. All use regular-grade 87-octane gasoline. Corolla sedans and hatchbacks will likely stand pat for model-year 2019. The next-generation sedan is slated to premiere in calendar 2019 as a 2020 model. It will use a version of Toyota’s “TNGA” modular architecture that is currently employed by the Prius hatchback, Camry sedan, and C-HR crossover. We expect a redesigned iM to adopt the TNGA platform as well, and it will probably debut at the same time as the sedan. The current iM uses a completely different platform than the sedan and is imported to the United States from Japan (the sedan is made in Canada). As a further cost-saving measure, Toyota could add future US-spec Corolla production to its new factory in Turkey that currently makes the C-HR. We won’t speculate too much on powertrains, but we think the company could scrap the present models’ CVT in favor of a conventional 8- or 10-speed automatic. The engine will likely remain a 1.8-liter four-cylinder but with direct fuel injection that should increase power and fuel economy. Fiat 500L, which is even more crude and less refined than the Corolla while also having a reputation for poor reliability and resale value. Mitsubishi Lancer, another low hurdle to clear we’ll admit, but it has the same issues as the 500L, and it can potentially cost a lot more than a Corolla, even with steep dealer discounts. Honda Civic, which shares the Corolla’s reputation for reliability and strong resale value while being more refined and fun to drive; you can also get the Civic as a two-door coupe if you want. Hyundai Elantra, the new class standard for refinement; its only significant drawback is the fact that Hyundai limits driver-assistance features to the most expensive trim level, where they’re standard on all Corollas. Mazda 3, which deftly blends style and substance, though desirable amenities will can potentially cost you plenty.